I am entering a relatively busy knitting cycle at the moment, working away steadily on several things which will (I promise) be revealed here in the fullness of time as they are completed. I also still have my Portland cabled pullover which is getting steady morning bus knitting time and is proceeding apace, although at this stage any progress photos have the effect of looking like just more of the same cables I showed you back when I was working the first piece…So it’s all ticking along, but it is also true that much of this is knitting work requiring a fair chunk of my brain and/or concentration. Which I love, because I sort of love sinking my teeth into skills-building (or skills-requiring) projects, but the brain needs rest at some point. And this is where nice plain socks come in. Here are my finished 3×1 ribbed socks, in Socks That Rock lightweight (Never on Sunday colourway, purchased last summer at Lettuce Knit during Toronto’s TTC knitalong). A few people have asked me about these, wondering what the stitch pattern is – really, for real and true, all it is is ribbing. Work as you would a regular plain sock, but instead of working plain stockinette over the leg and instep, work “k3, p1” ribbing instead. It’s a small thing that, to me, makes a world of difference. It makes you pay attention just enough that you’re not bored, but not so much that it stops being relaxing. I now prefer ribbed socks to stockinette for just that reason, and there is also the added bonus that they fit a tiny bit more snugly thanks to the ribbing. They look nice; do you use toe up or top down? I like to keep socks going too so I always have something to knit on when I’m with friends/people who might get a little bit irritated if I keep checking a chart or ticking off rows in my little knitting book. Thank you for the blog. Love seeing what you’re knitting up! These are lovely! I haven’t made socks yet, and am a little bit intimidated by them, but these might be the way to start. Ever since knitting thuja in 3X1 as my first sock, I too became a fan. How many stitches did you cast on in the STR lightweight? I love the colors! I too always have a sock going but now I’m going to have to make in ribbing! I know what you mean about having brainer and no-brainer projects going at the same time. I almost always have a pair of socks on the needles, no matter what else I’m doing. It’s an addiction. Love your socks with their lovely colours. I too have discovered the power of ribbed socks and just finished one ribbed sock for myself (just one sock, but I’ll get to the second one eventually). Now that I’m past the “need to think about this slightly” colorwork portion of the sweater (for the DH), I may have to attempt socks again. My first attempt failed beautifully due to a misunderstanding about how to join the round. Having muddled through that a time or 3, I may just be able to get the hang of starting them. Heels still read like intimidating little buggers, though…. P.S. 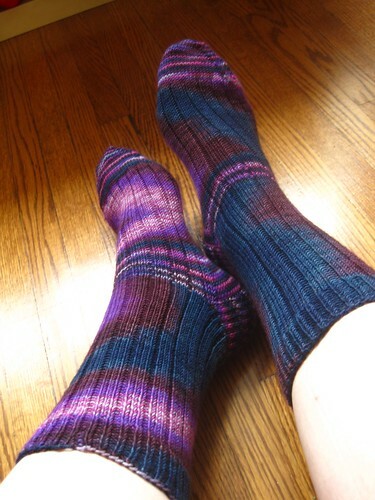 Love, love, love the way those socks turned out! 😀 Very pretty! Yum! I’m soooo close to finishing your Mulled Wine Mitts I can taste it, and since having discovered this whole “magic loop” thingy, am most excited to try a pair of socks in sock weight yarn. Of course, your colourway choice looks better than any in my stash, so may have to hit the LYSs for inspiration. Inspiring as always Glenna, me, and my LYSs say thanks! I love 3×1 ribbing for my socks too. Keeps them up nicely. Does the 3 x 1 ribbing require slightly more stitches than a plain vanilla stockinette pair of socks? I enjoy your blog. Keep writing as well as knitting! I use the same # of sts as on a plain sock! With a slightly longer length to make up for the bit more horizontal stretch. I know that you have already given the stitch count for yourself, but I am thinking of using this pattern for a man with size 13 ft. I have 2 skeins of STR but was wondering how I figure out how many stitches to cast on? Those socks are fantastic! I love the way the pooling works with the pattern.